Bhamini Kamudu Applasawmy at RGSC in front of DNA exhibit. 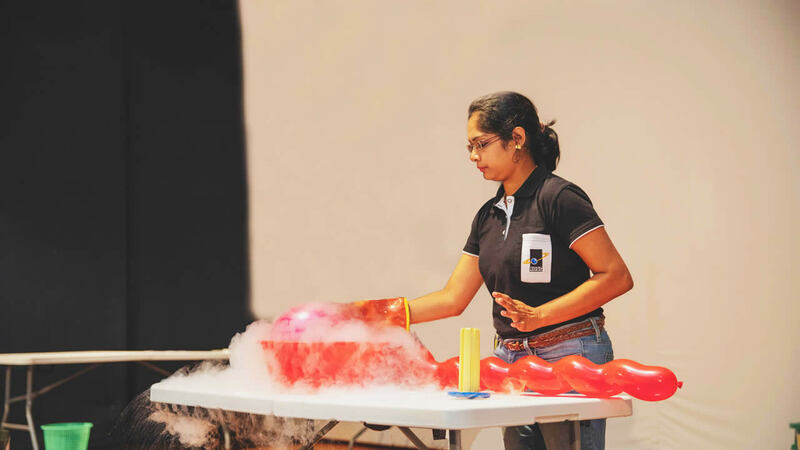 Resource Officer in the Education Department for the past ten years at the Rajiv Gandhi Science Centre, Bhamini Kamudu Applasawmy aims to encourage our young people to develop a scientific mind. 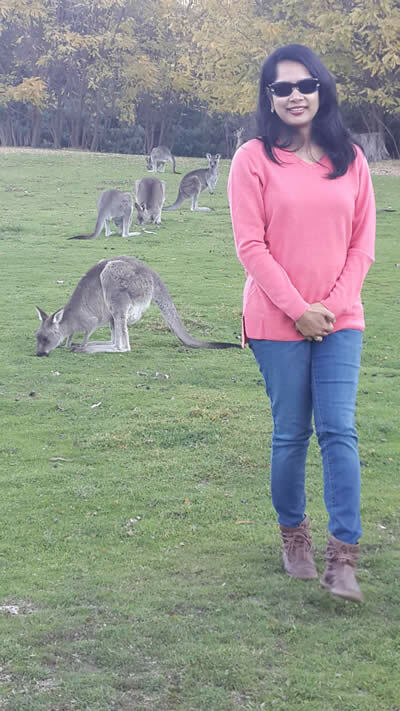 She shares with us how she got into the science world, how her Australia Awards Fellowship in Science Centre Leadership has helped her in her career and how she is looking forward to the future. Since childhood, Bhamini Kamudu Applasawmy was drawn towards science. Later, her passion for this subject matter and the influence of her science teachers inspired her to choose a career in this field. Working as Resource Officer in the Education Department at the Rajiv Gandhi Science Centre (RGSC) for the past ten years, the woman professional shares with us her career pathway. Bhamini completed her secondary schooling at Queen Elizabeth College, which she trusts, has played a key role in forging her character. She completed her first degree in Biology and then a Masters in Research Methodology at the University of Mauritius. “I think I was drawn towards science, especially biology, from an early age. As a child, I used to dissect flowers and crush the petals to examine what was inside. I used to have fun colouring my drawing books with plant pigments: Red and purple! During my secondary school days, I think my teachers played a key role in influencing me to opt for a career in science. I have to admit that they were successful at making science interesting enough to inspire me to choose a career as scientist,” she states. 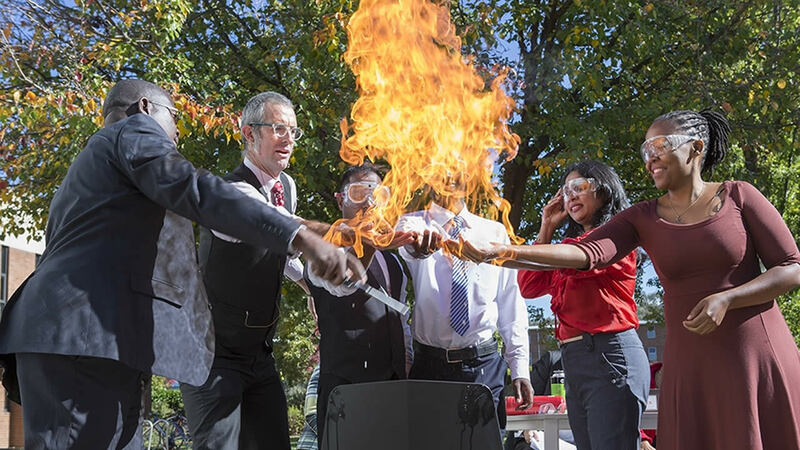 Bhamini doing a Science Experiment with other delegates in Australia. As a child, she dreamt of a career in teaching but Bhamini started as a guide at the Mauritius Museums Council. She later shifted to working as a Biology Educator in a secondary school for about a year before joining the Rajiv Gandhi Science Centre as Resource Officer in the Education Department. Driven by her go-getter personality, Bhamini, however, did not rest on her laurels. She decided to follow a Professional Development Course on Science Centre Leadership at the Centre for Public Awareness of Science (CPAS) at the Australian National University and Questacon- the National Science and Technology Centre of Australia. The course focused on empowering young professionals in science communication and science centre management. “Focus was on how to engage our audience and develop impactful science programmes that will trigger interest in science. A large part of the programme dealt with networking amongst ourselves (participants from African Countries) but also networking with other science centres in Australia. I had the opportunity to visit and interact with the directors and staff of Questacon (one of the world famous science centres), the Bendigo Science Centre, Wollongong Science Centre and planetarium and Early Start Discovery Space in Wollongong and the Sydney Powerhouse Museum,” she shares. I was inspired by the modesty and passion of these people for science communication. A very enriching experience indeed and I came back empowered, determined and with strong bonds developed with the Australian Institutions and my African colleagues." 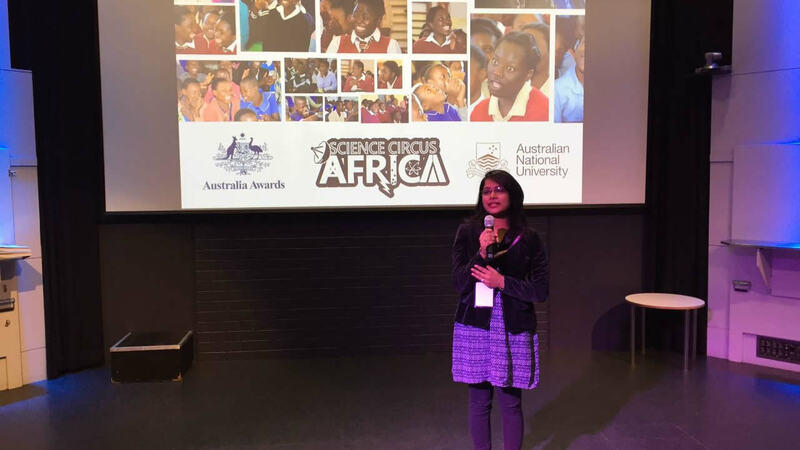 Bhamini states that she felt honoured to have been trained and mentored by three eminent personalities in science communication, namely Prof. Mike Gore (founder of Questacon, Australia), Prof. Sue Stocklmayer (a well-known researcher in science communication), Dr. Graham Walker (Manager, Science Circus Africa), and supported by Questacon. “I was inspired by the modesty and passion of these people for science communication. A very enriching experience indeed and I came back empowered, determined and with strong bonds developed with the Australian Institutions and my African colleagues,” she underlines. Bhamini giving a speech on Mauritius at Questacon. The challenge is to manipulate the equipment and chemicals, demonstrate, explain the science, entertain and involve the audience and all this at the same time. You need to be a good public speaker and be skilful at manipulating your instruments." 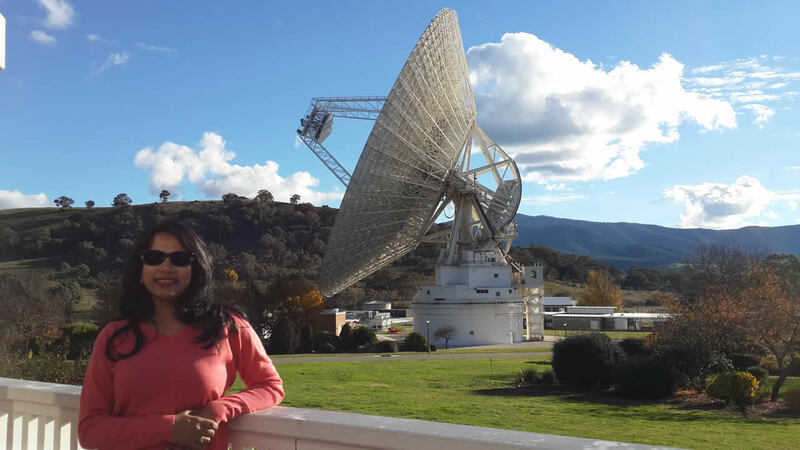 At the Canberra Deep Space Communication Complex. 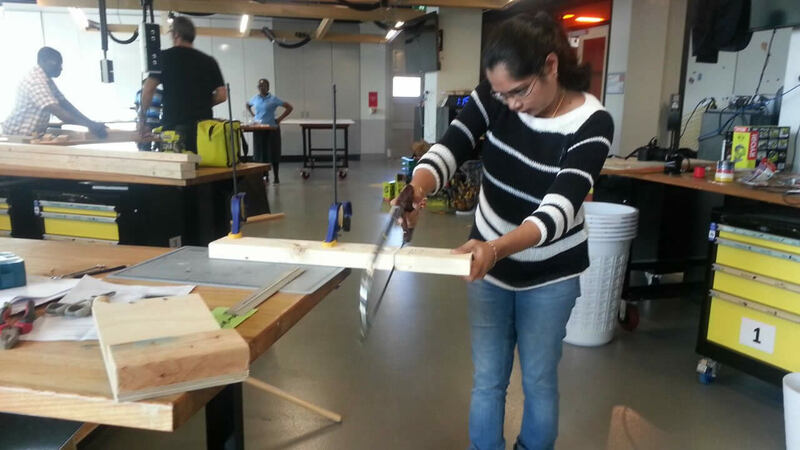 Fabricating Exhibits at Questacon Workshop. Regarding professional projects in the pipeline, Bhamini reveals that she is looking forward to the hosting of an international Youth Conference on Sustainability where participants of the ‘Young Australians Plan for the Planet’ will be interacting with Mauritian Students, participants of the Young Mauritians Plan for the Planet. “I next look forward to supporting other countries in Africa and Singapore to implement the Young Persons Plan for the Planet in their countries,” she underlines. Doing science show using liquid Nitrogen.